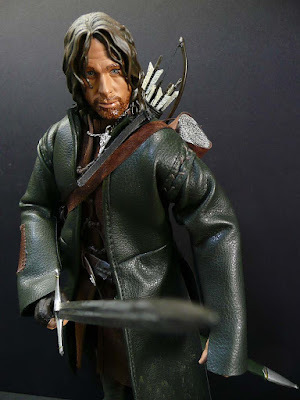 A totally different kind of ranger from those we know, Aragorn is Strider the Ranger from the Third Age of Middle Earth. 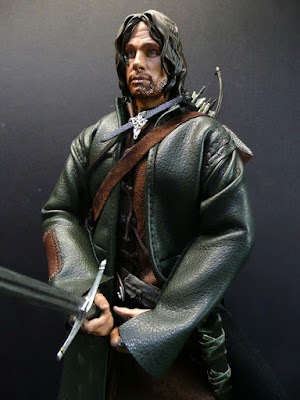 Aragorn was only two years old when his father Arathorn was killed while pursuing Orcs. 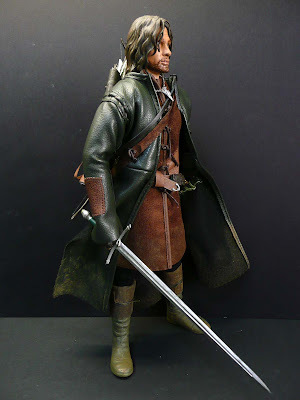 Aragorn was fostered by Elrond, Lord of Rivendell and later became sixteenth Chieftain of the Dúnedain, the Rangers of the North. 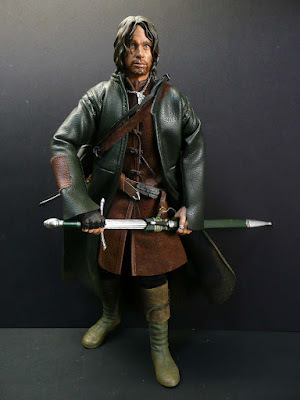 He became known as Strider when he and his followers began to guard a small land known as the Shire, inhabited by the diminutive and agrarian Hobbits. This was based on Gandalf's advice, whom he had met and became close friends with. Never read the book but my first exposure to The Lord of the Rings was in 1978 when the animated version came out. Director Ralph Bakshi had made extensive use of rotoscoping, a technique in which scenes are first shot in live-action, then traced onto animation cels. It is nothing like the animation of today but it was an eye-opener then and it only costs $4 million to make but grossed $30.5 million. 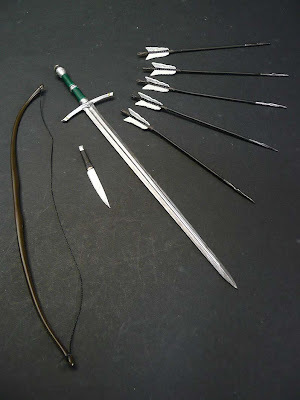 That was my introduction to Middle Earth and hobbits, elves, dwarves, and wizards who lived amongst men and the ensuing battle with Sauron's forces (Sauruman, Ringwraiths and orcs). 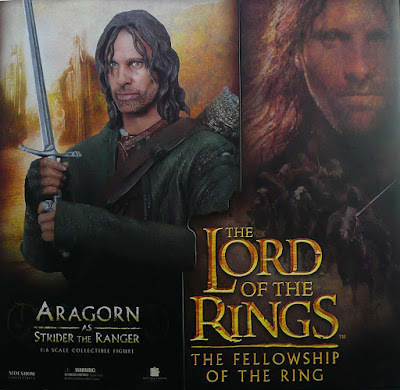 Unfortunately, there was supposed to be a sequel as the animated movie only covered the first half of the book and ended at the battle of Helm's Deep and with Frodo and Sam encountering Gollum who leads them to Mount Doom - basically, up to Peter Jackson's "The Two Towers (2002)" - but the sequel never materialised. What an anti-climax!! Had to wait 23 years for Peter Jackson's "The Lord of the Rings" film trilogy (2001 - 2003). At least the 23-year wait was worth it! 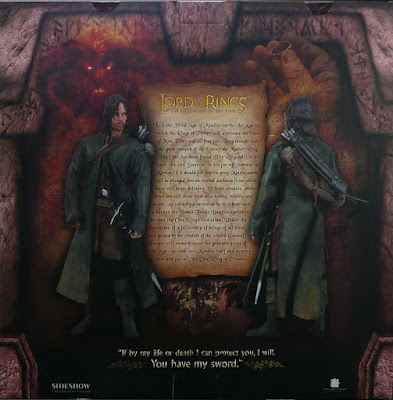 We discovered that Middle Earth does exists (it's now called New Zealand) and the wizard Gandalf and Aragorn, heir in exile to the throne of Gondor, unite and rally the Free Peoples of Middle-earth, who are ultimately victorious in the War of the Ring. 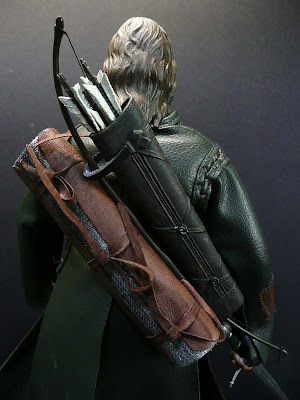 Sideshow's Aragorn as Strider the Ranger comes with grey shirt worn under sleeveless jerkin, trousers, long duster, Ranger belt, boots, oil pouch, sharpening stone pouch, the Evenstar pendant, utility knife, sword with scabbard including utility knife scabbard, bow, five arrows in quiver, arrow sleeve and bed roll. 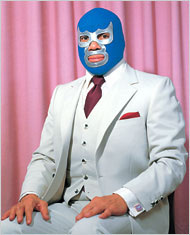 True to J.R.R. 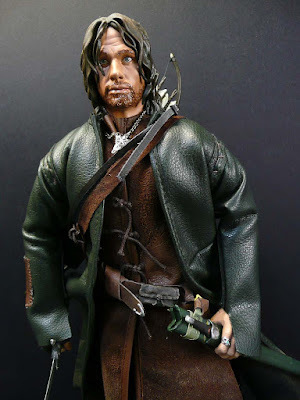 Tolkien's The Lord of the Rings book, Aragorn wears "rusty green and brown" and as a Ranger, avoided metal armor as the weight would wear him down, preferring fine linen and travel-worn leather. 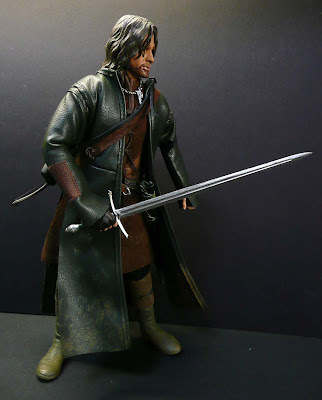 The role of Aragorn was given to Viggo Mortensen. 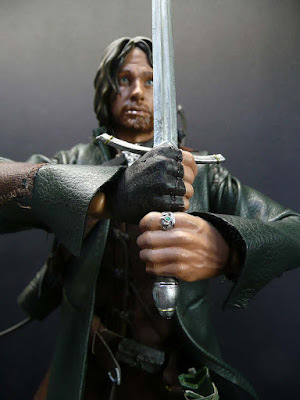 With his ruggedly handsome exterior and coolly courageous performance, actor Viggo Mortensen embodies Aragorn in a way that's wholly true to both J.R.R. 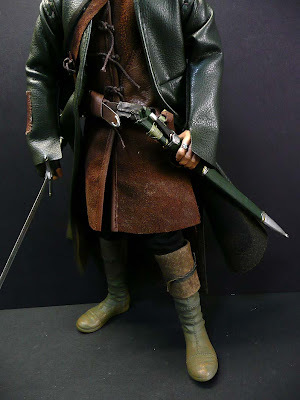 Tolkein's literary creation and Peter Jackson's cinematic vision. Unfortunately, Sideshow's head sculpt doesn't do him justice. I remembered Viggo as US Navy SEAL Master Chief John 'Jack' Urgayle in "GI Jane (1997)". His recent role as Nikolai Luzhin in "Eastern Promises (2007)" earned him a nomination for Best Actor at the 80th Academy Awards. 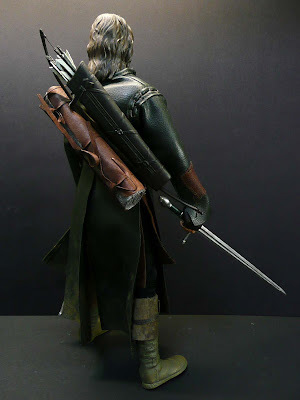 The scabbard was plain but had wrapped to it under the leather covering a small second scabbard containing a utility knife which is used for day-to-day tasks. 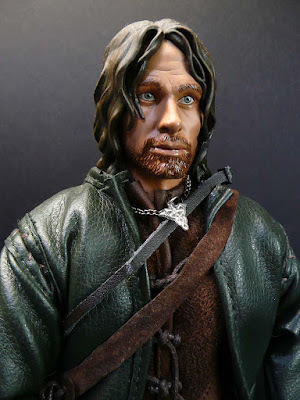 Sideshow's Aragorn has a blank look like he's just staring into space, daydreaming about making out with Arwen, played by the lovely Liv Tyler who was a hoot as Jewel in "One Night at McCool's (2001)". 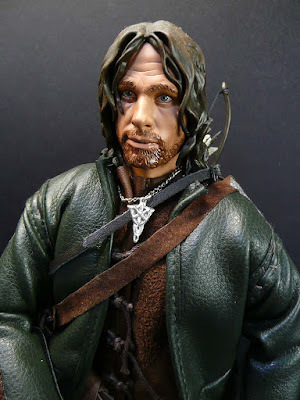 He wears the Evenstar which Arwen gives to him as a reminder of their love. The only suitable pose for his upward (awkward) looking gaze is to take a shot of him from higher up, a top down perspective. "Yoo hoo! 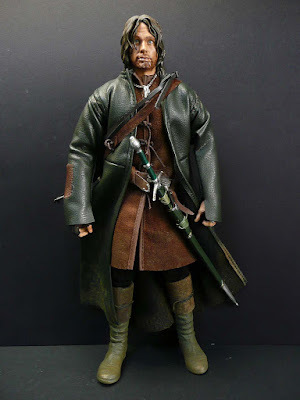 Vigo..? Anybody home?"